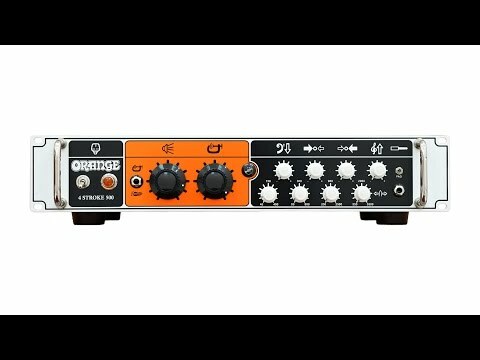 La série 4 Stroke est l'offre d'Orange pour le bassiste moderne exigeant - tout ce dont vous avez besoin, et rien de ce que vous n'avez pas. Avec un circuit entièrement analogique, le 4 Stroke 300 & amp; 500 parlent avec une autorité authentique, délivrant des tons puissants avec une accentuation naturelle et arrondie qui laisse des amplis de classe D dans leur sillage. The Class AB 4 Stroke stays crystal clean and expressive all the way up, without ever becoming sterile or fatiguing. The centrepiece of these amps is the uncompromising tone stack which allows for an unparalleled level of control over the EQ without the fussiness that plagues so many. The active four-band parametric EQ covers an enormous range and opens up limitless possibilities. Whether you need to sculpt your signature sound, bring out the character of your instrument or combat troublesome acoustic environments, the 4 Stroke deals with all comers in an instant. For the finishing touch, our proprietary Class A compression circuit tracks seamlessly, adding further punch and fatness. On the rear, you’ll find the usual essentials: two parallel speaker outputs (min. total load 4 Ohms), plus balanced and line level outputs. Dimensions: 48,2 x 10 x 26,5 cm, Weight: 10,05 kg. Possédez-vous Orange 4 Stroke 500 , ou avez-vous eu l'occasion de l'essayer?